You'd imagine I'd have learned by now that one new item of tackle is the kiss of death for a session, so a multitude of new items and new rigs will be apocalyptic. 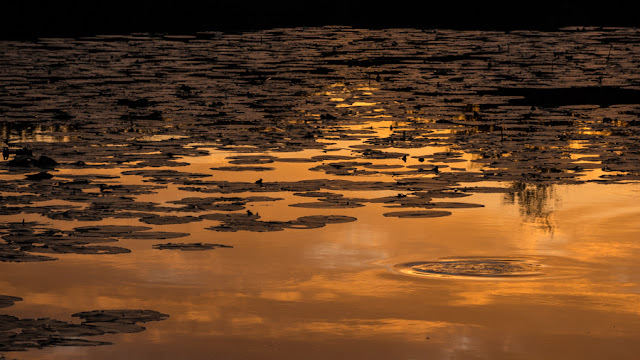 Although it is getting late in the year Wednesday night was forecast to be hot so a trip to Yosemite Lodge to play with my catfish hooks and some other gear was in order. After catching a supply of livebaits I stuck two out, one on a pop up leger rig the other on my slightly modified dumbell rig. The third rod started out with three 16mm halibut pellets on a running leger. All I've done to the dumbell is fit different sized polyballs. 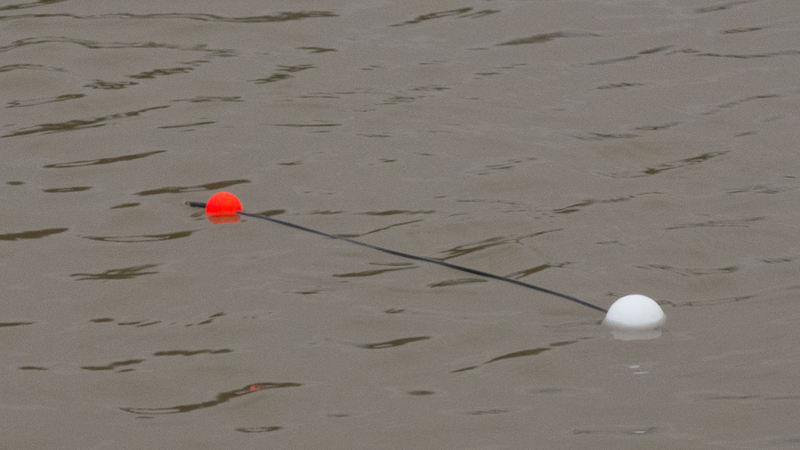 The idea being to prevent the bait pulling the one closest to the lead under as it swims away. It works, to a degree, although I doubt it matters. All rigs were fishing the Varivas Chinu hooks in various sizes. New hooks must be the most certain jinx of all. Or maybe not. New rods usually mean a string of fruitless trips. If only one rod out of three is new than that's the one that won't get a take in ages. As it turned out the rod I was hoping to put a bend in did get a take. But it was dropped. The legered livebait had been savaged during the night. What I'd imagined were bleeps caused by the bait getting agitated must have been a dropped take. 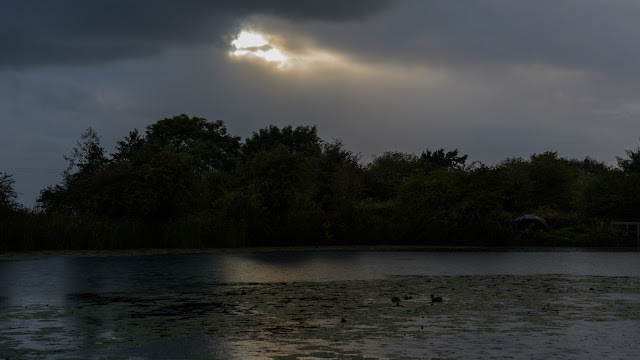 As it got dark I gave up on the pellets and set up a suspended worm rig. This was using a more catfish oriented hooklink to present a bigger bait than one or two lobs for eels. Unfortunately my lobworms had pegged out. 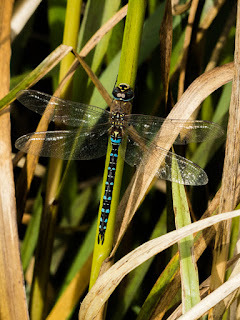 One or two had some life in them but the majority were limp. Thankfully not turned stinky, so I shoved a good bunch on the maggot clip and cast the rig out. Twice during the night, which was so warm I didn't need a fleece until morning when the wind and rain arrived in the morning, the worms got attacked by something. The short lifts of the bobbin suggested that something small might be nibbling at the worms. Roach or perch, perhaps. But both times the twitches turned into slow steady runs. Which I missed. Both times the worms were gone. I was reduced to using dendrobenas. 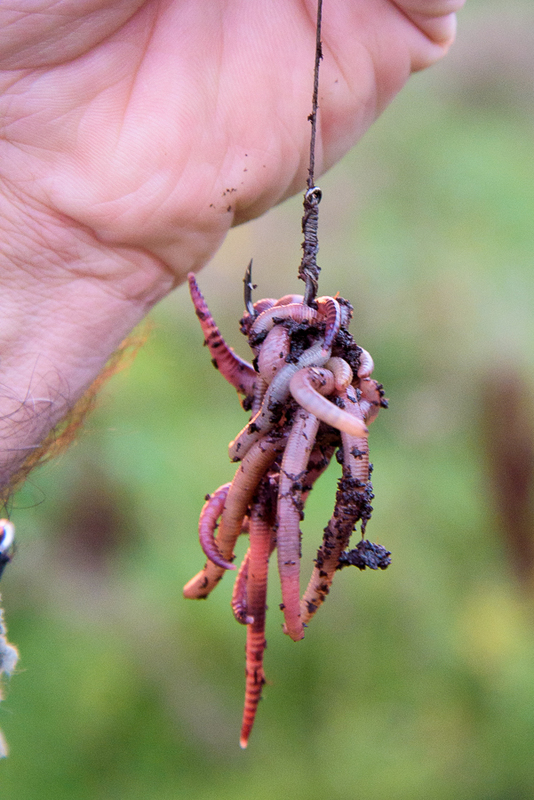 As many as I could cram on the maggot clip and more on the hook itself. This got almost immediate attention. The twitches followed by slow runs and missed strikes continued into daylight. I was beginning to wonder if tiny kittens were the culprits when, at five to eight, I got a surprise when my strike met sold resistance. Whatever it was didn't fancy coming my way and a tug of war ensued. This didn't feel like a kitten. After a few yards it didn't feel like a cat either. 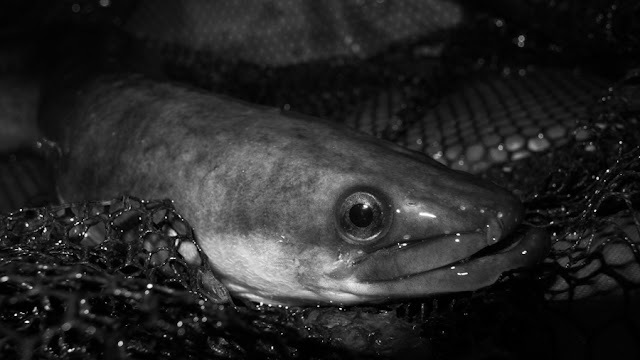 That side to side head shaking suggested eel. This was confirmed when a big head broke surface. Amazingly the fish went in the net first time. All became clear. Although it was a big (for me) eel most of the worms being on a hair rigged clip had probably prevented it engulfing the lot as I'm sure a catfish would have. The small barb on the Chinu made getting the hook out easy. Much easier than holding the darned thing for a trophy shot. Hence the photo below! With that mystery answered I reverted to the pellets. Once more I got a surprise when they steamed off at a rate of knots. And another when the culprit turned out to be a carp of about seven pounds! Sod that. Time to try squid. My experience of using squid as bait for eels got me thinking of ways to mount bigger pieces for catfish. Another of my ideas was put into practice. 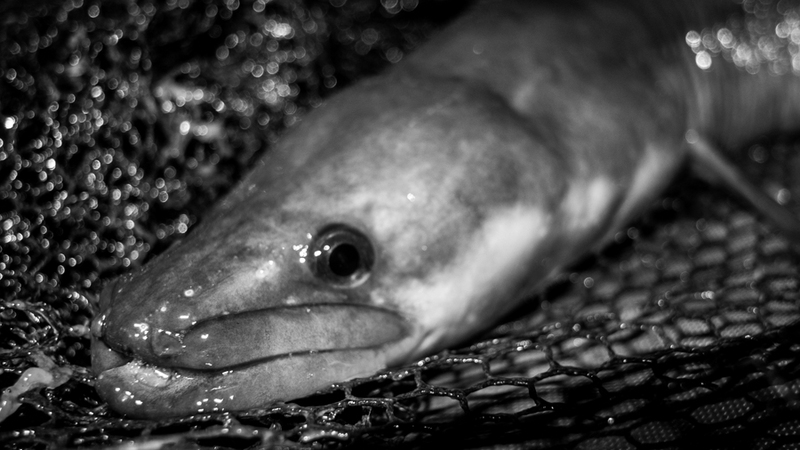 The hair goes through the bait towards the head end, a Fox 'Pellet Peg' acting as the stop. The hook isn't nicked into the bait at all. To streamline things for the cast the hooklink is half-hitched around the tapering part of the squid. In the photo below one half-hitch is used, but this was just my starting point. There's more experimenting to be done with hook positions if I start using the bait more in the future. Both the previous fish had come close in where I'd baited with trout pellets so I cast the squid well out away from the feed. I had a funny feeling that I should have fished the windward bank instead of getting the wind behind me. Then again, when the wind picked up and drove the rain it would have been a touch unpleasant with it in my face. Thankfully the forecasters were on the ball and by tennish the sun was shining and drying things out nicely. Even the wind was warmer. When the alarm sounded once more and the spool on the squid rod was spinning at an alarming rate I knew it had to be a cat. Wrong. A silly little carp had decided to try a squiddy snack. That was the final straw. 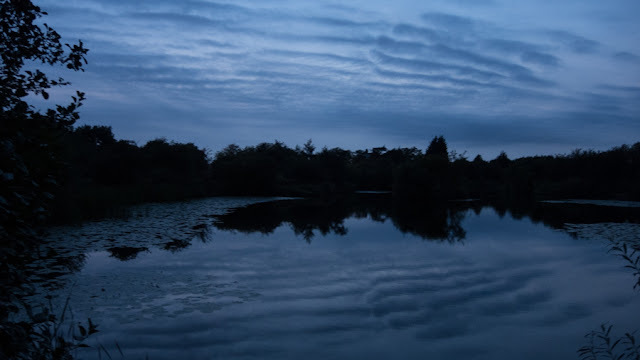 Although I cast another bait out it was time to draw a line under the session before I caught any more carp. As it turned out my timing was good. I had barely got in the car when the rain returned. Three fish landed. None of my target species and all three to the one rod that didn't have new line on the reel and the one which was my least preferred of the three to use for catfishing. 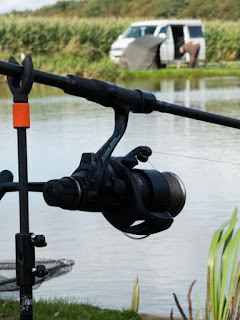 The Chinu hooks look like they might suit me, at least in sizes larger than a 2, but the rod and mainline I wanted to evaluate didn't get a testing. The suspended worm rig worked again for the eel... It looks like it'll be a good long while before I try it for cats again, and that eel has knocked another target for the year off my to-catch list. So I'm back to being stuck for inspiration. Or am I? What is it with hook sizes? The bane of my life these days is finding hooks of a pattern and size to do what I want. 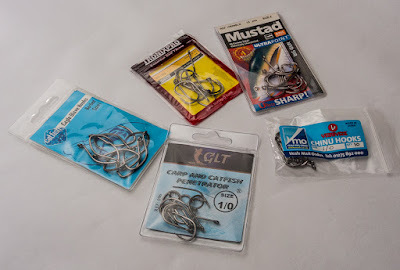 If tackle shops stocked a wider range of hooks it would be easy to pop in, look at what there was and select the exact hook I want. But they don't. That means ordering on-line. In turn that puts me at the whim of the hook manufacturers' sizing strategies. I recently came a cross a commercial which has something in it I'd quite like to catch which has a maximum size 8, barbless, rule. So I ordered some size 8 barbless hooks, sight unseen, and when they arrived they turned out to be smaller than the size tens I use - more like a twelve. 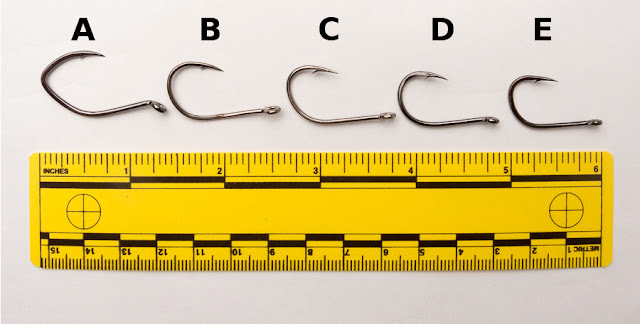 This was unusual because I get the feeling that hooks intended for use on commercial fisheries are larger for their stated size these days than hooks used to be in order to get round these daft rules. It's been no better in my quest for catfish hooks. This search has been continuing among the sea fishing sections of various websites. I've bought hooks marketed for catfishing and been less than impressed. Some have been more like shark hooks in the wire gauge. 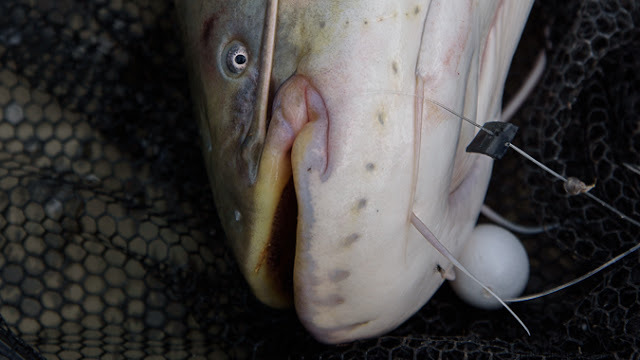 In my limited experience of catching catfish they are a bit like barbel in that when a hook goes in it stays in, and if a hook goes in to the bend it's unlikely to open out. The same with pike and anything else really, there's no great need for extra thick wire. Thick enough, but not so thick as to make penetration difficult. Another pet hate of mine is rank barbs. As the top photo shows I have got hold of a few patterns of hook to compare. The Eagle Wave (A below) and Penetrator (E) are proven catfish hooks, although I'm not keen on the look of them! The others are sea fishing hooks. The Mustad 'Big Gun' (C) was bought years ago to tie pike flies on, but was too heavy. It looks almost perfect in shape and wire strength. The Tronix 'Big Dog' (B) is very similar but a little finer in the wire and with a neater barb. The Varivas 'Chinu' (D) has the perfect wire gauge and a neat barb, and is available in a wide range of sizes from 3/0 to 8 - whatever that will be like when I get some delivered! When it comes to ordering the sizing again becomes a lottery. 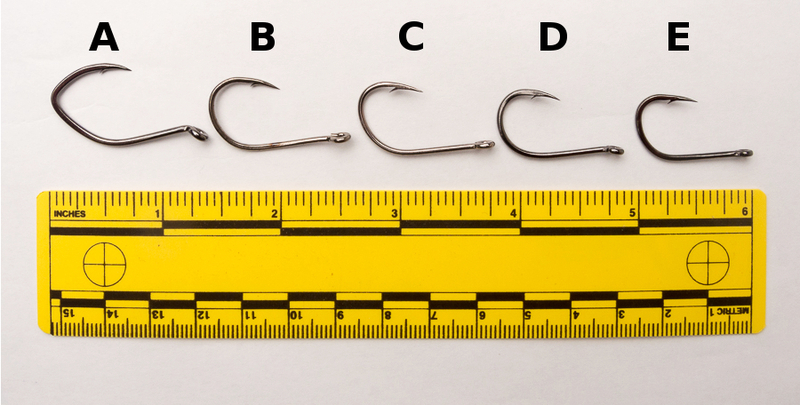 The hooks below are sized: A - 1, B - 1/0, C - 2, D- 1/0, E - 1/0. It's nice that the sea hooks are a lot cheaper than those marketed for catfishing. Surprising, because when you do some internet digging it becomes apparent where the catfish hooks come from, and that their original purpose was sea fishing. Of course price shouldn't be a major consideration when it comes to hooks. The hook and the line are the most important items of tackle which demand ultimate reliability. But those traces of Scots and Yorkshire blood in my veins mean I can't see any good reason to pay a fiver for a packet of hooks when two or three quid will get me some that do exactly the same job. 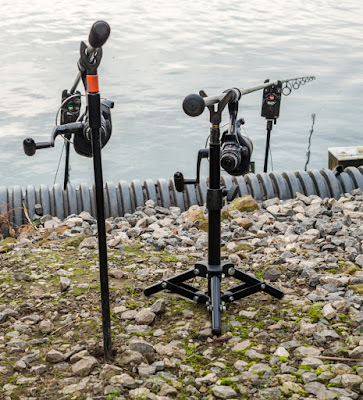 If the Tronix hooks are up to the job they're only a pound for ten! I'm also looking out for hooks to use for eels. 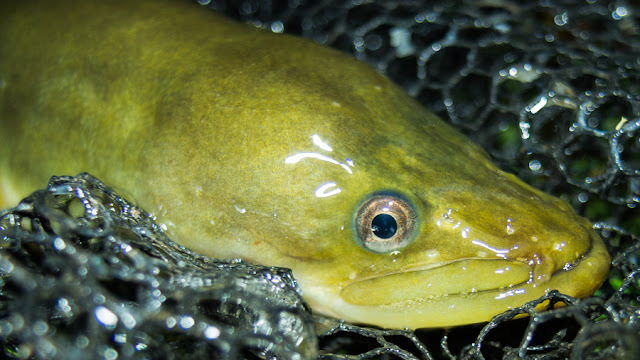 I slipped up recently when I sold off the last of my stocks of Owner single hooks, only to discover that a couple of patterns were useful for eels. 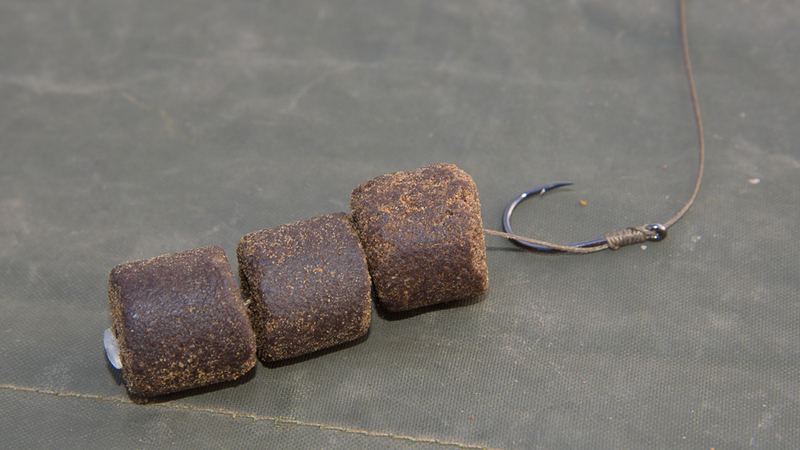 The C5-X makes a good worm hook for eels in an eight, and the size 1 C-4 might be handy for boilies or worms for catfish. While involved in my hook odyssey I've come across some interesting monos and braids for hooklinks and mainline for various species. I hadn't realised that Amnesia is available in 6lb, for example. It's surprising what can cross over from one discipline to another if you forget the label that says 'sea' or 'game' (I've been looking at saltwater fly hooks) or whatever the marketing people think tackle should be used for. I realise that some anglers only buy stuff that is labelled for their kind of fishing, but that's their loss. I remember when I worked in a tackle shop one customer refused to buy a 3lb test rod because it was called a 'specimen' rod and not a 'pike' rod. I must have a word with some of my rods for catching the wrong species! 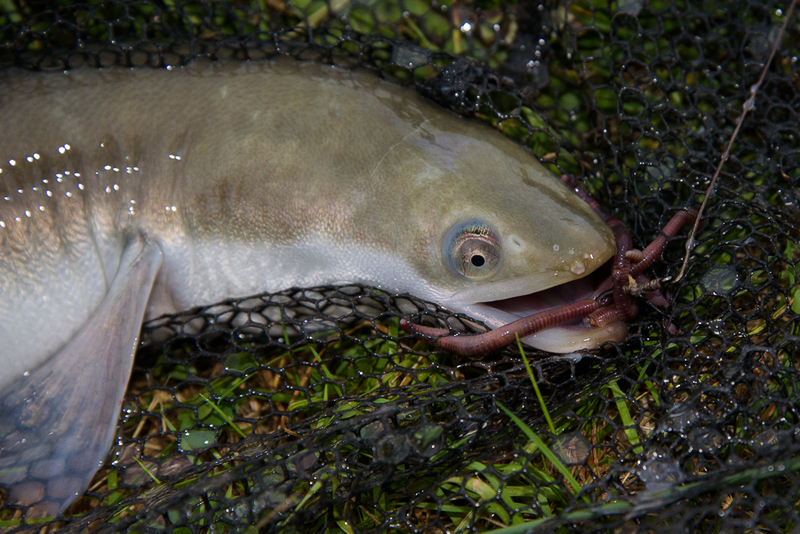 It's getting in to autumn now so my chances of more eels and catfish are likely to reduce as the month goes on. More catfish? Well, I have sneaked one out on the only session I've managed since I got the urge. That's how I know the Big Gun is a decent hook but with slightly too big a barb, and that my revised polyball leger rig works as well as its predecessor. If work hadn't been getting in the way I'd have had more cracks at cats instead of snatching short eel sessions recently. I might have to make time before it gets too cold. I'd forgotten how much fun catfishing is, and how cute catfish look. I want to try that suspended worm rig out for the cats now I know it catches eels and pike, and I have a new blank to play with. Sod it. If it's warm next week work can wait!